Most of the transfers on this list are to clubs under UEFA's jurisdiction, and most of the purchasing clubs are from England, France, Italy and Spain. Three players appear on the list twice: Neymar, Ángel Di María and Cristiano Ronaldo. All of the players on the list are of European (UEFA), South American (CONMEBOL), North America (CONCACAF) and African (CAF) origin. Following the transfer of American Christian Pulisic of the CONCACAF confederation in 2019, there are currently no players on the list from the remaining regions; Asia (AFC) and Oceania (OFC). ^ Fee was to be paid over time with an initial €105 million, plus another €5 million in additional bonuses; Pogba's agent Mino Raiola also received a reported €27m from Juventus, from a portion of aforementioned transfer fee from Manchester United. ^ Fee was to be paid over time with an initial £75 million, plus another £15 million in additional bonuses. ^ Kepa paid his own termination clause, as is mandatory in Spain, making him a free agent. He subsequently signed for Chelsea. ^ Initial transfer fee for Ibrahimović is indeterminable. According to Barcelona's press release, Ibrahimović signed a 5-year contract, for €46 million fee in installments and the exchange of Eto'o (valued at €20 million) and the loan of Alexander Hleb (with an option to buy for a €10 million fee), with a €250 million release clause, making Ibrahimović worth €66 million plus the undisclosed loan fee of Hleb. However, the Hleb deal collapsed. Eventually Ibrahimović cost Barcelona €69.884 million according to their financial report, which included other fees. As per the Inter book the fee was €69.5 million, but part of the Inter fee (max. 5% according to FIFA regulation) were deducted and distributed by Barcelona to youth clubs of Ibrahimović: Malmö FF and AFC Ajax as solidarity contribution. ^ Fee was to be paid over time with an initial £58 million, plus another £12 million in additional bonuses. ^ Initial fee of £56 million with reported performance related bonuses of £9 million. ^ Fee was to be paid over time with an initial £44 million, plus another £5 million in additional bonuses. ^ Estimated figure. The transfer fee has not been disclosed. ^ Lazio broke the then-world transfer record by paying £35 million (£16 million upfront and transferred Matías Almeyda and Sérgio Conceição) to acquire Crespo. The total transfer fee later amounted to £40 million. ^ Fee was to be paid over time with an initial €57.1 million, plus another €2 million in additional bonuses. Neymar received a €10 million signing bonus. Neymar's agent also received €4 million. ^ Fee was to be paid over time with an initial £50 million (€57M), plus another £7 million in additional bonuses. ^ Fee was to be paid over time with an initial £50 million (€57M), plus another £3 million in additional bonuses. ^ £48.8m with £8.8m in add-ons. ^ Fee was to be paid over time with an initial €53 million (£46.5M), plus another €7 million (£6.1M) in additional bonuses. ^ Manchester United paid £36 million up front for Martial, but his contract contains three bonus clauses worth £7.2 million each, taking the potential fee to £57.6 million. The clauses each relate to certain accomplishments being achieved in the next four years, including if Martial scores 25 goals during that span, amasses 25 caps for France or wins the Ballon d'Or before June 2019. The first player to ever be transferred for a fee of over £100 was Scottish striker Willie Groves when he together with Jack Reynolds (£50) made the switch from West Bromwich Albion to Aston Villa in 1893, eight years after the legalisation of professionalism in the sport. It took just twelve years for the figure to become £1000, when Sunderland striker Alf Common moved to Middlesbrough. It was not until 1928 that the first five-figure transfer took place. David Jack of Bolton Wanderers was the subject of interest from Arsenal, and in order to negotiate the fee down, Arsenal manager Herbert Chapman got the Bolton representatives drunk. Subsequently, David Jack was transferred for a world record fee when Arsenal paid £10,890 to Bolton for his services, after Bolton had asked for £13,000, which was double the previous record made when Sunderland signed Burnley's Bob Kelly a fee of for £6,500. Diego Maradona and Ronaldo were twice transferred for world record fees. The first player from outside Great Britain to break the record was Bernabé Ferreyra, a player known as La Fiera for his powerful shot. His 1932 transfer from Tigre to River Plate cost £23k, and the record would last for 17 years (the longest the record has lasted) until it was broken by Manchester United's sale of Johnny Morris to Derby County for £24k in March 1949. The record was broken seven further times between 1949 and 1961, when Luis Suárez Miramontes was sold by FC Barcelona to Inter Milan for £152k, becoming the first ever player sold for more than £100k. In 1968, Pietro Anastasi became the first £500k player when Juventus purchased him from Varese, which was followed seven years later with Giuseppe Savoldi becoming the first million pound player when he transferred from Bologna to Napoli. After Alf Common and David Jack, the third player to twice be transferred for world record fees is Diego Maradona. His transfers from Boca Juniors to Barcelona for £3m, and then to Napoli for £5m, both broke the record in 1982 and 1984 respectively. 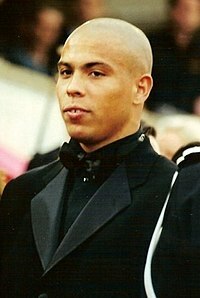 The most recent is Ronaldo with his record-breaking move from PSV Eindhoven to Barcelona in 1996 for £13.2m, although Alan Shearer's transfer to Newcastle broke the record the same summer. A year later Inter Milan paid £19.5m for Ronaldo and again he became the player with the highest transfer fee. In the space of 61 days in 1992, three transfers broke the record, all by Italian clubs: Jean-Pierre Papin transferred from Marseille to A.C. Milan, becoming the first ever £10m player. Almost immediately, rivals Juventus topped that with the signing of Gianluca Vialli for a fee of £12m from Sampdoria. Milan then completed the signing of Gianluigi Lentini for a fee of £13m which stood as the record for three years. The 1996 transfer of Alan Shearer from Blackburn Rovers to Newcastle United, for a fee of £15m, kickstarted a year-by-year succession of record breaking transfers: Ronaldo moved the following year to Inter Milan from FC Barcelona for a fee of £17m, which was followed in 1998 by the shock transfer of his fellow countryman Denílson from São Paulo to Real Betis for a fee of approximately £21m. In 1999 and 2000, Italian clubs returned to their record-breaking ways, with Christian Vieri transferring from Lazio to Inter Milan for £28m, while Hernán Crespo's transfer from Parma to Lazio ensured he became the first player to cost more than £30m. The transfer prompted the BBC to ask "has the world gone mad"? It took two weeks for the record to be broken when Luís Figo made a controversial £37m move from Barcelona to rivals Real Madrid. A year later, Real increased the record again with a signing of Zinedine Zidane for £48 million (150 billion lire). Zidane's record stood for 8 years, the longest since the 1940s. Real Madrid continued with the Galácticos policy by buying Kaká from Milan for €67 million (£56 million), which was the world record in pound sterling. However, both world record in euro and in pound sterling were broke by Real themselves when signing Cristiano Ronaldo for £80m (€94m) from Manchester United in the same transfer window, 4 years later Real Madrid broke the record again after completed the signing of Gareth Bale from Tottenham Hotspur in 2013. Although Real initially insisted that the transfer cost €91.59 million, slightly less than the Ronaldo fee, the deal was widely reported to be around €100 million (around £85.1 million). Documents leaked in 2016 by Football Leaks revealed that installments brought the final Bale fee up to a total of €100,759,418. In 2016, Manchester United eventually took the record away from Real Madrid, signing French midfielder Paul Pogba for €105 million (£89 million), four years after having released him to Juventus for training compensation. A year after the Pogba transfer, however, there was a major jump in the record fee. Paris St. Germain matched the €222 million buyout fee of Barcelona's Neymar, converted to a reported £198 million or £200 million by different sources. This was the first time that the record fee was paid by a French club. Comparison of fees in different nations is complicated by varying exchange rates. This table uses British Pound Sterling prior to 1999 and Euro from 1999 to present. Kylian Mbappé, the most expensive teenager and the most expensive player in a domestic transfer. Philippe Coutinho, the most expensive midfielder. Virgil van Dijk, the most expensive defender. Kepa Arrizabalaga, the most expensive goalkeeper. ^ a b c Glendenning, Barry; Murray, Scott; Bagchi, Rob; Steinberg, Jacob (30 August 2013). "The Joy of Six: record transfers". The Guardian. ^ a b c d e "Neymar: Paris St-Germain sign Barcelona forward for world record 222m euros". BBC Sport. Retrieved 4 August 2017. ^ "FC Barcelona communiqué on Neymar Jr" (Press release). FC Barcelona. 3 August 2017. Retrieved 3 August 2017. ^ a b c d e Wallace, Sam. "Neymar becomes most expensive footballer of all time in £198m move to PSG (paid for with one cheque)". The Daily Telegraph. Retrieved 4 August 2017. ^ a b c d e Lowe, Sid; Laurens, Julien; Hunter, Andy. "Neymar set to seal world-record move to PSG worth £450m in fees and wages". The Guardian. Retrieved 4 August 2017. ^ "Neymar Jr signs with Paris Saint-Germain!". PSG. 3 August 2017. Retrieved 3 August 2017. ^ a b c d Lovett, Samuel. "PSG sign Neymar from Barcelona in £200m world-record deal". The Independent. Retrieved 4 August 2017. ^ "Mercato – PSG : Nouveau coup de tonnerre dans le feuilleton Mbappé ?". le10sport (in French). 2 September 2017. Retrieved 14 July 2018. ^ "Philippe Coutinho: Liverpool agree £142m deal with Barcelona for Brazil midfielder". BBC Sport. 6 January 2018. Retrieved 6 January 2018. ^ "Ousmane Dembélé, FC Barcelona's new signing" (Press release). FC Barcelona. 25 August 2017. Retrieved 25 August 2017. ^ "Ousmane Dembele: Barcelona close to signing Borussia Dortmund forward". BBC Sport. 25 August 2017. Retrieved 25 August 2017. ^ "Borussia Dortmund confirm Barcelona close to Ousmane Dembele deal". ESPN FC. 25 August 2017. Retrieved 25 August 2017. ^ a b "United Sign Pogba". Official Manchester United Website. Retrieved 8 August 2016. ^ "Paul Pogba: Manchester United re-sign France midfielder for world-record £89m". BBC Sport. 8 August 2016. Retrieved 8 August 2016. ^ Rej, Arindam (8 August 2016). "Paul Pogba completes record transfer to Manchester United from Juventus". ESPN. Retrieved 8 August 2016. ^ "Gareth Bale contract leak sparks panic at Real Madrid – and agent's fury". The Telegraph (21 January 2016). 21 January 2016. ^ "Spurs accept £85m Bale bid". BBC Sport. 1 August 2013. Retrieved 2 September 2013. ^ "Real Madrid Sign Midfielder Gareth Bale For World-Record $132 Million". CBS News New York. 2 September 2013. Retrieved 2 September 2013. ^ Wilson, Jeremy (2 September 2013). "Gareth Bale joins Real Madrid from Tottenham for a world record fee of £86m". The Daily Telegraph. Retrieved 2 September 2013. ^ Peck, Brooks (1 September 2013). "Gareth Bale finally sold to Real Madrid and it's even FIFA 14 official". Yahoo!. Retrieved 7 September 2013. ^ "Cristiano Ronaldo is the boss at Real Madrid, says Gareth Bale". Sports.ndtv.com. Agence France-Presse. 2 September 2013. Retrieved 7 September 2013. ^ AS Diarioas (6 September 2013). "Real Madrid tell CR7: "You're still the most expensive player ever"". AS.com. Retrieved 7 September 2013. ^ "Bale transfer fee revealed". FIFA. 15 October 2013. Retrieved 15 October 2013. ^ "Man Utd accept £80m Ronaldo bid". BBC Sport. 11 June 2009. Retrieved 2 September 2014. ^ Ogden, Mark (11 June 2009). "Cristiano Ronaldo transfer: Real Madrid agree £80 million fee with Manchester United". The Daily Telegraph. London. Retrieved 5 November 2010. ^ "Ronaldo agrees six-year Real deal". BBC Sport. 26 June 2009. Retrieved 27 June 2009. ^ "Gonzalo Higuain: Argentina striker joins Juventus from Napoli". BBC. 26 July 2016 – via BBC Sport. ^ Gladwell, Ben (26 July 2016). "Juventus complete Gonzalo Higuain signing from Napoli in €90 million deal". ESPN. Retrieved 26 July 2016. ^ sport, Guardian; Reuters (26 July 2016). "Gonzalo Higuaín seals £75.3m move from Napoli to Juventus". The Guardian. ^ "Romelu Lukaku: Man Utd sign Everton striker for initial £75m on five year deal". BBC. 10 July 2017 – via BBC Sport. ^ "United Sign Romelu Lukaku". Official Manchester United Website. Retrieved 10 July 2017. ^ "Romelu Lukaku signs for Man United to complete switch from Everton". ESPN. 10 July 2017. Retrieved 10 July 2017. ^ Ducker, James (10 July 2017). "Romelu Lukaku completes Manchester United move in deal that could reach world record £90m". The Daily Telegraph. Retrieved 10 July 2017. ^ "Virgil van Dijk: Liverpool to sign Southampton defender for world record £75m". BBC Sport. Retrieved 28 December 2017. ^ "Luis Suarez: Liverpool & Barcelona agree £75m deal for striker". BBC Sport. 11 July 2014. Retrieved 11 July 2014. ^ Whaling, James (28 March 2016). "Luis Suarez's Barcelona transfer fee "revealed as £65m" – £10m LESS than his Liverpool release clause". Mirror. Retrieved 29 August 2016. ^ "FC Bayern sign Lucas Hernández". fcbayern.com (in German). Retrieved 27 March 2019. ^ a b "Kepa pays termination clause". Athletic Bilbao. 8 August 2018. Retrieved 8 August 2018. ^ a b "Kepa arrives at Chelsea". Chelsea F.C. 8 August 2018. Retrieved 8 August 2018. ^ a b "Reports and Financial Statement at 30 June 2002" (PDF). Juventus F.C. 20 September 2002. Retrieved 29 August 2013. ^ Fifield, Dominic (10 July 2001). "Real hail £46m Zidane". The Guardian. Retrieved 2 September 2014. ^ "Zidane makes record Real switch". BBC. 9 July 2001. Retrieved 2 September 2014. ^ a b "Zidane al Real". Juventus F.C. (in Italian). 9 July 2001. Archived from the original on 6 August 2001. Retrieved 15 September 2011. ^ "James Rodríguez signs for Real Madrid for a reported £63m". The Guardian. 22 July 2014. Retrieved 22 July 2014. ^ Rice, Simon (22 July 2014). "James Rodriguez joins Real Madrid". The Independent. Retrieved 22 July 2014. ^ "Official announcement: James Rodríguez". Real Madrid C.F. 22 July 2014. ^ "Real Madrid sign James Rodriguez from Monaco in £63million deal". Sky Sports. 22 July 2014. Retrieved 22 July 2014. ^ Jackson, Jamie (26 August 2014). "Ángel di María completes record £59.7m move to Manchester United". The Guardian. Retrieved 2 September 2014. ^ Delaney, Miguel (24 August 2014). "Man United agree Angel Di Maria fee". ESPN. Retrieved 29 May 2016. ^ "Kevin de Bruyne: Manchester City sign Wolfsburg midfielder". BBC Sport. 30 August 2015. Retrieved 30 August 2015. ^ "Kevin De Bruyne completes move to Man City from Wolfsburg". Sky Sports. 30 August 2015. Retrieved 30 August 2015. ^ "Thomas Lemar: Atletico Madrid newcomer 'very happy' to complete move". BBC Sport. 30 July 2018. Retrieved 30 July 2018. ^ "Zlatan Ibrahimovic signs five-year deal at Barcelona". The Guardian. 27 July 2009. Retrieved 2 September 2014. ^ "Relazione sulla Gestione". FC Internazionale Milano SpA 2008–09 Bilancio (PDF)|format= requires |url= (help) (in Italian). Italian C.C.I.A.A. 2010. p. 4. ^ "Nota Integrativa". FC Internazionale Milano SpA 2009–10 Bilancio (PDF)|format= requires |url= (help) (in Italian). Italian C.C.I.A.A. 2011. pp. 6, 18. ^ "área económica". Memoria 2009–10 (PDF) (in Spanish). FC Barcelona. 18 October 2010. pp. 173, 184. Archived from the original (PDF) on 15 May 2012. ^ "Kaka completes Real Madrid switch". BBC. 9 June 2009. Retrieved 2 September 2014. ^ Wilson, Jeremy (7 June 2009). "Real Madrid to confirm world record £56m signing of Kaka". The Telegraph. London. Retrieved 2 September 2014. ^ "Kaka agrees move to Real Madrid". The Guardian. 9 June 2009. Retrieved 2 September 2014. ^ Perez, Mike (1 July 2009). "Kaka sets sights on toppling Barcelona". The Independent. London. Retrieved 2 September 2014. ^ "2009 Bilancio" (PDF) (in Italian). A.C. Milan. 31 August 2010. p. 76. Archived from the original (PDF) on 22 November 2010. Retrieved 13 August 2017. ^ "Morata is a Blue". Chelsea F.C. 21 July 2017. Retrieved 22 July 2017. ^ "Chelsea agree £58m initial fee for Alvaro Morata". The Telegraph. 21 July 2017. ^ "LAPORTE PAYS RELEASE CLAUSE". Official website. 29 January 2018. Retrieved 29 January 2018. ^ "Paris St-Germain sign Edinson Cavani from Napoli on five-year deal". Sky Sports. 16 July 2013. Retrieved 2 September 2014. ^ "Edinson Cavani joins Paris St-Germain from Napoli for £55m". BBC. 16 July 2013. Retrieved 2 September 2014. ^ "Edinson Cavani joins Paris Saint-Germain for French club record fee". The Guardian. 16 July 2013. Retrieved 2 September 2014. ^ Rice, Simon (16 July 2013). "PSG beat Real Madrid and Manchester City to £54m signing of Edinson Cavani". The Independent. London. Retrieved 2 September 2014. ^ "Christian Pulisic: Chelsea sign Borussia Dortmund forward for £58m". BBC Sport (British Broadcasting Corporation). 2 January 2019. Retrieved 2 January 2019. ^ Marshall, Adam (6 August 2015). "Manchester United completes sale of Angel Di Maria to Paris-Saint Germain". Manchester United F.C. Retrieved 6 August 2015. ^ "Angel Di Maria signs for Paris Saint-Germain until 2019". psg.fr. Paris Saint-Germain FC. 6 August 2015. Retrieved 6 August 2015. ^ "Di Maria completes £44m PSG move". BBC Sport (British Broadcasting Corporation). 6 August 2015. Retrieved 6 August 2015. ^ "Arsenal sign Borussia Dortmund striker for club record £56m". BBC Sport. 31 January 2018. Retrieved 31 January 2018. ^ "Pierre-Emerick Aubameyang completes £56m Arsenal move". The Guardian. 31 January 2018. Retrieved 31 January 2018. ^ Pearce, James (19 July 2018). "Liverpool confirm signing of Alisson Becker in world record deal". Liverpool Echo. Retrieved 19 July 2018. ^ McNulty, Phil (14 July 2015). "Raheem Sterling: Man City sign winger in £49m deal". BBC Sport. Retrieved 19 July 2014. ^ "Man City transfers: Blues agree £49m Raheem Sterling deal". Manchester Evening News. Archived from the original on 4 March 2016. Retrieved 4 April 2016. ^ Ingle, Sean (25 July 2000). "Why £37m isn't too much to pay for Figo". The Guardian. Retrieved 2 September 2014. ^ "Figo joins Real Madrid in record £37m deal". The Independent. London. 24 June 2000. Retrieved 2 September 2014. ^ "Oscar to Depart". Chelsea FC. 23 December 2016. Retrieved 23 December 2016. ^ "巴西外援奥斯卡转会至上海上港集团足球俱乐部[Brazilian player Oscar joined Shanghai SIPG]". Shanghai SIPG F.C. 23 December 2016. ^ "Oscar: Chelsea midfielder to join Shanghai SIPG for about £60m". BBC Sport. 23 December 2016. Retrieved 24 December 2016. ^ "Radamel Falcao completes £51m transfer to Monaco". The Independent. London. 31 May 2013. Retrieved 2 September 2014. ^ Holyman, Ian (31 May 2013). "Monaco sign Falcao from Atletico". ESPN. Retrieved 2 September 2014. ^ "Liverpool agree club record deal for Leipzig midfielder for July 2018". BBC Sport. 29 August 2017. Retrieved 16 October 2017. ^ Fifield, Dominic (1 February 2011). "Fernando Torres: Joining Chelsea is a 'big step forward'". The Guardian. Retrieved 2 September 2014. ^ "Torres makes record move from Liverpool to Chelsea". BBC. 31 January 2011. Retrieved 2 September 2014. ^ "Manchester United: Brazilian Fred joins from Shakhtar Donetsk for £47m". BBC. 21 June 2018. Retrieved 21 June 2018. ^ Evans, Nic; Goss, Patrick (12 July 2000). "Crespo denies world record fee". Sky Sports. Retrieved 2 September 2014. ^ "Lazio's £40m Crespo deal". BBC. 11 July 2000. Retrieved 2 September 2014. ^ "Transfer news: Man City sign Monaco defender for £52m striker". BBC Sport. 24 July 2017. Retrieved 16 October 2017. ^ "Detailed figures of Neymar transfer". FC Barcelona. 24 January 2014. Retrieved 3 August 2017. ^ "Barcelona: Neymar deal has damaged brand of La Liga club". BBC Sport. 10 March 2014. Retrieved 21 January 2016. ^ "Barcelona reveal details of deal to sign Brazil star Neymar". Sky Sports. 24 January 2014. Retrieved 27 September 2014. ^ "Barcelona offers Neymar deal details". ESPN. 24 January 2014. Retrieved 27 September 2014. ^ "Jorginho: Chelsea sign Napoli midfielder after Man City pull out of deal". BBC Sport. 14 July 2018. Retrieved 14 July 2018. ^ "Kyle Walker joins City on Five-Year deal". mancity.com. 14 July 2017. Retrieved 14 July 2017. ^ Wilson, Paul (14 July 2017). "Kyle Walker signs for Manchester City in world-record £53m deal for a defender". The Guardian. Retrieved 14 July 2017. ^ "Transfer news: Atletico Madrid complete deal for Chelsea striker". BBC Sport. 26 September 2017. Retrieved 16 October 2017. ^ Sheen, Tom (13 June 2014). "David Luiz: PSG defender signed five-year deal after £50m move from Chelsea". The Independent. Retrieved 2 September 2014. ^ "Transfer news: Paris Saint-Germain confirm £50million purchase of Chelsea's David Luiz". Sky Sports. 13 June 2014. Retrieved 2 September 2014. ^ "PSG sign Chelsea defender Luiz on a five-year deal". ESPN. 13 June 2014. Retrieved 2 September 2014. ^ "Brazil striker Hulk joins Shanghai in £320,000-a-week deal". The Guardian. 30 June 2016. Retrieved 15 August 2016. ^ "Халк продолжит карьеру в Китае" (in Russian). FC Zenit Saint Petersburg. 30 June 2016. Retrieved 1 July 2016. ^ "Manchester City complete £47.5m signing of John Stones from Everton". The Guardian. 9 August 2016. Retrieved 9 August 2016. ^ "John Stones: Manchester City sign Everton defender for £47.5m". BBC Sport. 9 August 2016. Retrieved 9 August 2016. ^ "John Stones completes £47.5m move to Manchester City from Everton, after Uefa website unexpectedly breaks news". The Telegraph. 9 August 2016. Retrieved 9 August 2016. ^ Bretland, Elliott (9 August 2016). "Manchester City sign John Stones from Everton in £47.5m six-year deal". Daily Mail. Retrieved 9 August 2016. ^ "Transfer of Alexandre Lacazette to Arsenal" (PDF) (Press release). Olympique Lyonnais Group. 5 July 2017. Retrieved 6 July 2017. ^ "Alexandre Lacazette joins Arsenal for club record £46.5m from Lyon". BBC Sport. 5 July 2017. Retrieved 5 July 2017. ^ "Anthony Martial: Man Utd sign Monaco forward for £36m". BBC. 1 September 2015. Retrieved 1 September 2015. ^ Jackson, Jamie (1 September 2015). "Anthony Martial signs for Manchester United for £36m from Monaco". The Guardian. Retrieved 1 September 2015. ^ Upal, Sunni; Barlow, Matt (1 September 2015). "Manchester United complete £36m Anthony Martial transfer on four-year deal". Daily Mail. Retrieved 1 September 2015. ^ "Leroy Sane: Germany midfielder joins Man City in £37m deal". BBC. 2 August 2016. ^ "Everton sign £45m deal for Swansea midfielder". 16 August 2017. ^ Hytner, David (2 September 2013). "Mesut Ozil signs for Arsenal in a £42.5m transfer deal from Real Madrid". The Guardian. ^ Pitt-Brooke, Jack (2 September 2013). "Real Madrid midfielder Mesut Ozil completes move to Arsenal in £42.5m deal". The Independent. London. ^ Ornstein, David (2 September 2013). "Mesut Ozil: Arsenal sign Real Madrid midfielder for £42.4m". BBC. ^ Proud, Keith (18 August 2008). "The player with the Common touch". The Northern Echo. Archived from the original on 1 November 2012. Retrieved 12 January 2014. ^ a b c d e f g h i j k "World record football transfer fees". BBC. 1 September 2013. Retrieved 12 January 2014. ^ "Arsenal honour Thierry Henry, Tony Adams & Herbert Chapman". BBC. 7 December 2011. Retrieved 12 January 2014. ^ a b c d e f g h Flanagan, Chris (4 September 2013). "How 13 other world record transfers panned out". Four Four Two. Retrieved 12 January 2014. ^ Smyth, Rob (17 September 2016). "Ronaldo at 40: Il Fenomeno's legacy as greatest ever No9, despite dodgy knees". The Guardian. Retrieved 1 April 2017. ^ Turnbull, Simon; Nixon, Alan (30 July 1996). "Shearer goes home for pounds 15m". The Independent. London. Retrieved 12 January 2014. ^ "Ronaldo signs up for Inter". The Independent. London. 21 June 1997. Retrieved 12 January 2014. ^ Longmore, Andrew (7 June 1998). "Denilson The Menacing". The Independent. London. Retrieved 12 January 2014. ^ Whyte, Derrick (9 June 1999). "Inter's pounds 28m swap deal for Lazio's Vieri". The Independent. London. Retrieved 12 January 2014. ^ Agnew, Paddy (12 July 2000). "Crespo to join Lazio in record £36m transfer". The Guardian. Retrieved 12 January 2014. ^ "When transfers go mad". BBC. 12 July 2000. Retrieved 12 January 2014. ^ "Figo's the Real deal". BBC. 24 July 2000. Retrieved 1 September 2013. ^ Ley, John (9 July 2001). "Zidane in £48m Real deal". The Daily Telegraph. Retrieved 4 August 2017. ^ "Ronaldo completes record Madrid switch". UEFA. Retrieved 4 August 2017. ^ "Just how much did Bale's transfer to Real Madrid cost?". ITV. Retrieved 4 August 2017. ^ Conn, David. "Why Real Madrid think that even €100m for Gareth Bale is not silly money". The Observer. Retrieved 4 August 2017. ^ Percy, John. "Gareth Bale contract leak sparks panic at Real Madrid". The Daily Telegraph. Retrieved 4 August 2017. ^ "Paul Pogba: Manchester United re-sign France midfielder for world-record £89m". BBC Sport. Retrieved 4 August 2017. ^ "Daily Express". Record Transfer Fee. 17 October 1903. ^ Simkin, John (September 1997). "Alf Common". Spartacus Educational. ^ Taylor, Matthew (2005). The Leaguers: The Making of Professional Football in England, 1900–1939. p. 42. ISBN 9780853236399. ^ Mortimer, Gavin (2012). A History of Football in 100 Objects. ISBN 1847659055. ^ Where Are They Now – David Jack. 22 September 2014. Retrieved 15 March 2017. ^ Ferguson, Ed (13 December 2016). "When Falkirk broke the world transfer record". Retrieved 1 October 2017. ^ "Warney Cresswell". England Football Online. Retrieved 1 October 2017. ^ a b c d e Barnes, Stuart (2007). News of the World Football Annual 2007/2008. Invincible Press. ISBN 978-0-00-725555-9. ^ a b c d e f g h i j k l m n o p q r s t "The History of the World Transfer Record". BBC News. ^ Hughes, Rob (30 July 1996). "Newcastle United Pays Record $23 Million for Sheare". The New York Times. Retrieved 3 June 2009. ^ "World Cup winner Denilson on trial at Bolton Wanderers". Daily Mail. 6 January 2009. Retrieved 3 June 2009. ^ Ash, Russell (2004). Top Ten of Everything 2005. Dorling Kindersley. p. 225. ^ a b c d "Real tipped to land Kaka for £56m". BBC. 3 June 2009. Retrieved 3 June 2009. ^ "Kaka completes Real Madrid switch". 9 June 2009. Retrieved 10 August 2017. ^ "Ronaldo agrees six-year Real deal". BBC. 26 June 2009. Retrieved 26 June 2009. ^ "Cristiano Ronaldo transfer: Q&A of £80m deal between Real Madrid and Manchester United". The Daily Telegraph. London. 12 June 2009. ^ "Gareth Bale joins Real Madrid from Spurs in £85m world record deal". BBC. 1 September 2013. Retrieved 10 August 2017. ^ "Gareth Bale joins Real Madrid from Spurs in £85m world record deal". The Daily Telegraph. 2 September 2013. Retrieved 10 August 2017. ^ "Gareth Bale joins Real Madrid from Tottenham for a world record fee of £86m". The Telegraph. 1 September 2013. Retrieved 26 January 2014.